9,994 others viewed this post. The phallic looking thing at the bottom is sometimes called the Pipe Nebula, or if you are from New Zealand it’s the head of the Kiwi bird. 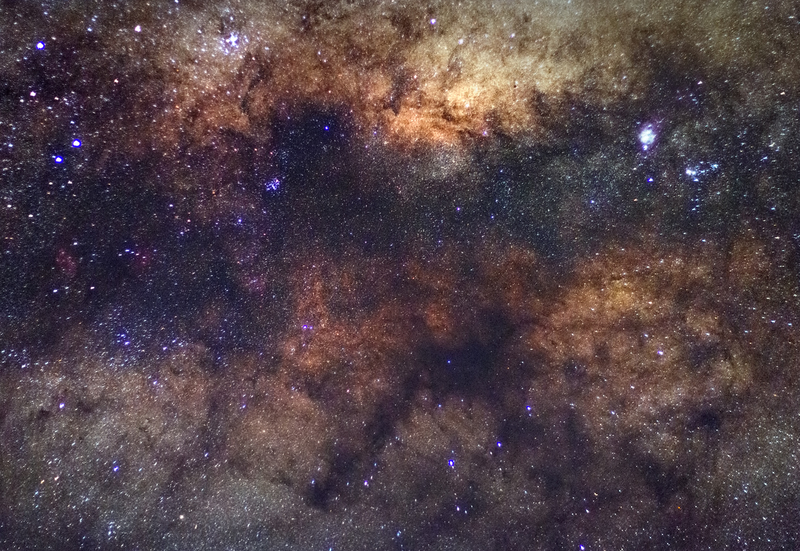 This photo is close to the centre of our galaxy, the brightest and densest area of the Milky Way. The middle of the photo is roughly the dead center of the Milky Way. This photo is a QUICK exposure(s) of 27 x 4s exposures = 96 seconds in total! No telescope, taken with a regular Canon 70D DSLR and Canon 50mm prime lens @ f2 / ISO 6400 on a cheap tripod. This is a cheap lens, like just over $100AUD (Link to Canon 1.8 50mm lens on Amazon). I hope this gives some of you some inspiration to get to a dark place with a camera, even if you don’t have lots of expensive equipment! Processing in Nebulosity / PixInsight & Photoshop.